Fully functional single speed Lewmar 7 removed from a Catalina 25. Lewmar Rocker Switch. Panel 2 1/8 x2 3/4. EASY SWAP OUT - CAN BE DONE IN MINUTES WITHOUT REMOVING WINDLASS FROM BOAT. WILL NOT FIT HORIZON 600/900 SERIES OR SPRINT 1000. Galvanized for corrosion protection. 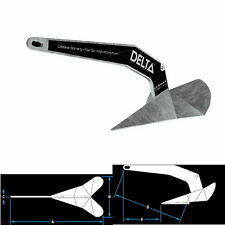 The carfully engineered weight distribution and apex ballasting allows the Delta to start setting right when it hits the bottom. Self launching and fast setting for quick, hassle free anchoring. One Pair of Lewmar #29101108 Rope Clutches - Grey. The Pro-Fish has an automatic freefall that allows you to pull right up over a wreck or ledge, and drop anchor with speed and precision. No more running your motor or wasting fuel while you hover fish. Trending at $74.22eBay determines this price through a machine learned model of the product's sale prices within the last 90 days. Maximum pulling power: 550 lbs. Its rugged aluminum centre case and durable composite side covers make Pro Sport the perfect choice. Do it yourself ready and easy to install. 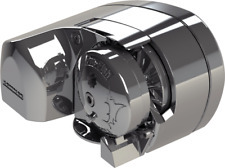 Designed around a highly efficient spur gearbox using a smaller, more powerful permanent magnet motor. No more running your motor or wasting fuel while you hover fish. Maximum pulling power: 700 lbs. Automatic freefall that allows you to pull right up over a wreck or ledge and drop anchor with speed and precision. Maximum pulling power: 700 lbs. It is do it yourself ready and easy to install. 5 year warranty. Dual Direction (Up/Down) Toggle Switch with polarity reversing. Friction-free surface to make dropping and weighing anchor easier Won't damage the deck or topsides Allows you to safely stow anchor while cruising and deploy at short notice Constructed of 304 stainless steel Range of rollers to fit the most common combinations of anchor, mounting style and boat . Lewmar’s High Load Racing Blocks represent the pinnacle of our standard block range. 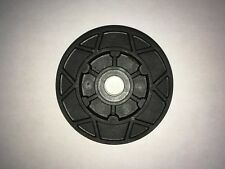 80mm 111 26 13 20 71. 2nd Generation Racing blocks feature Lighter form with smoother edges. 2400 4800 14 500 2xM8 1xM12. 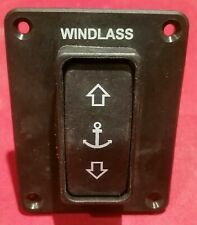 "UP" AND "DOWN" FOOT SWITCH FOR WINDLASS. WITH SAFETY CAP. Lewmar Synchro Series -60mm Fiddle, Becket, Cam Block. SWL1764# / 800kg. LEWMAR Synchro 50 fiddle block with cam cleat. Condition is New. Shipped with USPS First Class Package. Lewmar Dual Direction Toggle Switch Toggle switch with contactor built in. For smaller windlass's. LEWMAR 72mm Synchro Double Block 29927202BK. Condition is New. Shipped with USPS First Class Package. Lewmar V700 Verticle Anchor Windlass. Lewmar V700. Rocker switch. With 100% 316 stainless steel housing and a sleek flush-mount design that hides the motor down below, the V700 is one of the most attractive and durable windlasses on the market. We will not alter the sales price. 70 Amp Lewmar Windlass Circuit Breaker. Lewmar 42 Winch in excellent condition Stainless Fully operational No signs of excessive wear Will be packaged and shipped well. 72mm - Part #29927210BK. Lewmar Synchro Series. Triple Block with Becket and Cam Cleat. Lewmar 140TT 2.2 Gearbox/Lower Leg. Racing sailors appreciate the smooth operation and flawless performance. Cruising sailors can benefit from Lewmar’s race-bred engineering and simple tool-free maintenance. Lewmar uses the finest materials. LEWMAR PART # 6052904. PRE-TESTED TO INSURE PROPER FUNCTION. LEWMAR GUARDED ROCKER SWITCH. • The switch can be mounted at the helm as the main switch for operation or mounted at a second station as a secondary switch. LEWMAR DECK FOOT SWITCH 68000930. • Single direction switch. Boat part number 1078743 is a new anchor bow roller pulpit reign guide from Lewmar, part number unavailable. Part commonly used on Rinker Boats. Part Manufacturer: Lewmar. Boat Manufacturer: Rinker Boat. Manufacturer's Part Number: 57404. Lewmar 9# Delta Anchor. Its unique shank profile and ballasted tip make the Delta anchor self-launching. Also available in premium grade Duplex/High Tensile stainless steel. Their 10" length gives these handles the leverage for a wide range of uses from tensioning halyards to trimming sails. The standard grip features ball bearings for smooth rotation without resistance. 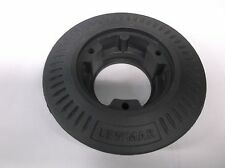 NEW LEWMAR D2 DOMINO ROPE CLUTCH. They give sailors the ability to organize and secure halyards, reefing lines, furler lines, outhauls and much more. Domino cluster design secures line over a greater area to prevent fraying lines. 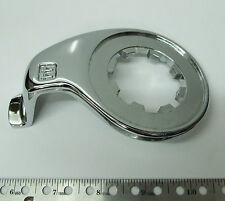 Lewmar Stainless Anchor Swivel 3/8"-1/2"
Lewmar Anchor Swivel is made from 316 Stainless Steel and can swivel 360 degrees. Attach the swivel between the anchor and the chain, allowing the rope to swivel instead of twisting up. Find us on.